A Soothing Tea Creation & a Recipe! Today I've brought you a fairly new set from Flourishes. even I love to buy coffee & tea images. 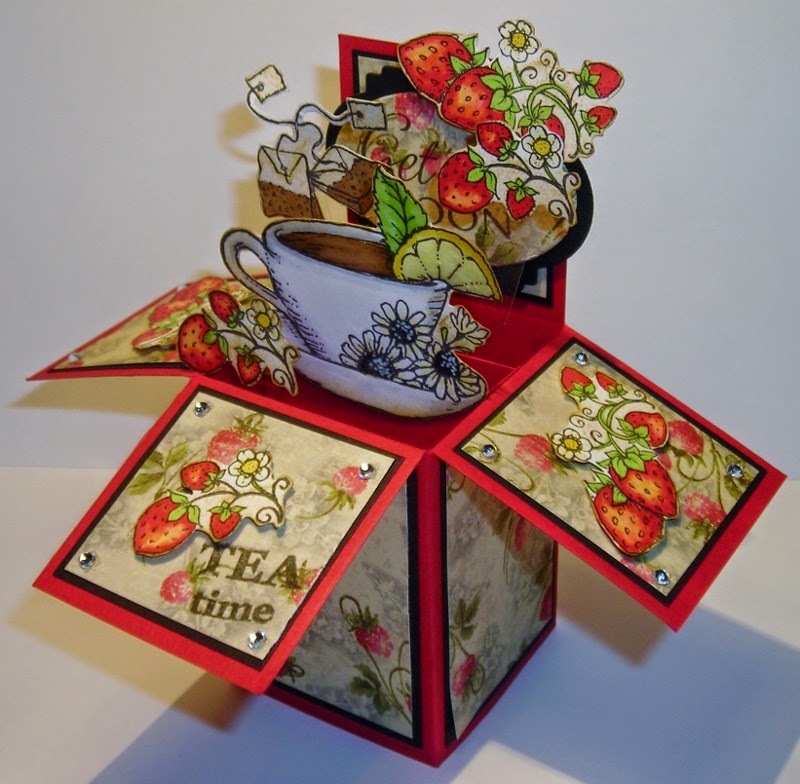 Tea images are some of my favorite! I love the ritual of having tea & all the finery...! so I made my card a "Get Well" Card. Indeed, would you know it, I've married a purse. And half pound of fly wings to make her some tea. This is from the Chinese Mother goose Rhymes, of 1900. 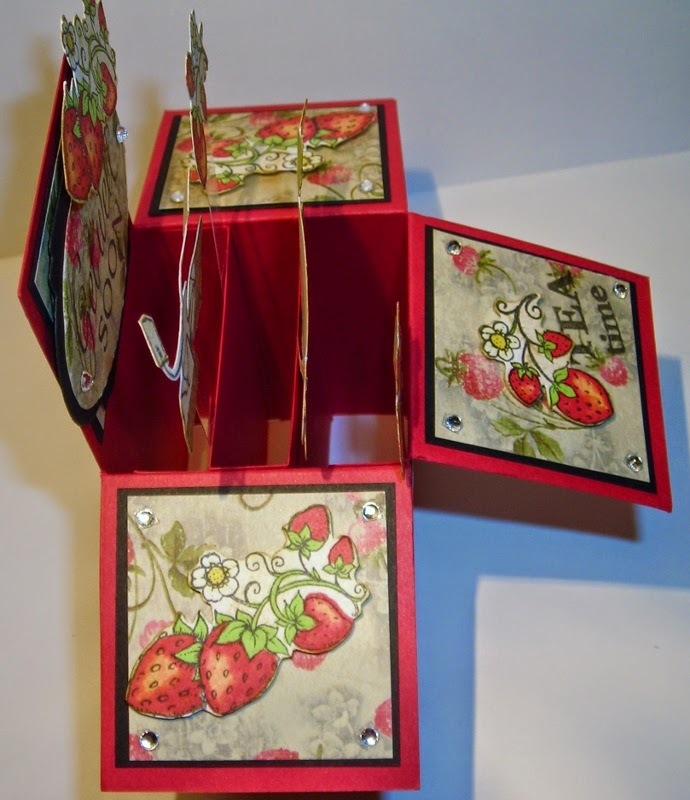 I have been admiring the Pop-Up Box Cards out there since they came out & I've never made one. You will want to view both of the videos to these tutorials as they both are very different from one another & offer their own tips. The flavor is Lemon & Strawberries, Oh my! until the box is opened. 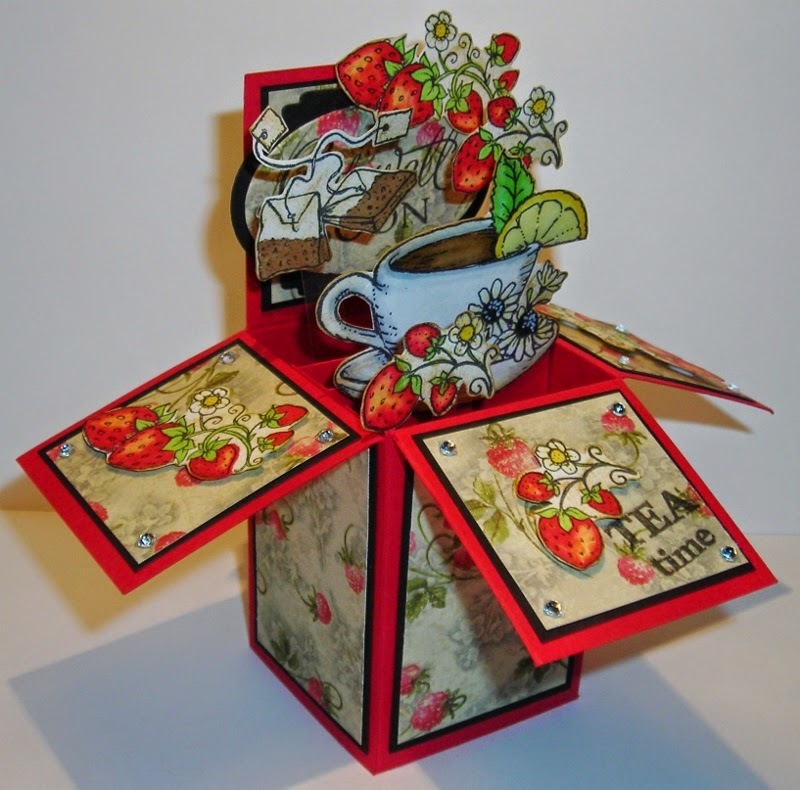 The little Tea Cup from Flourishes- Grab a Cup fits nicely into this Pop-Up Box Card. 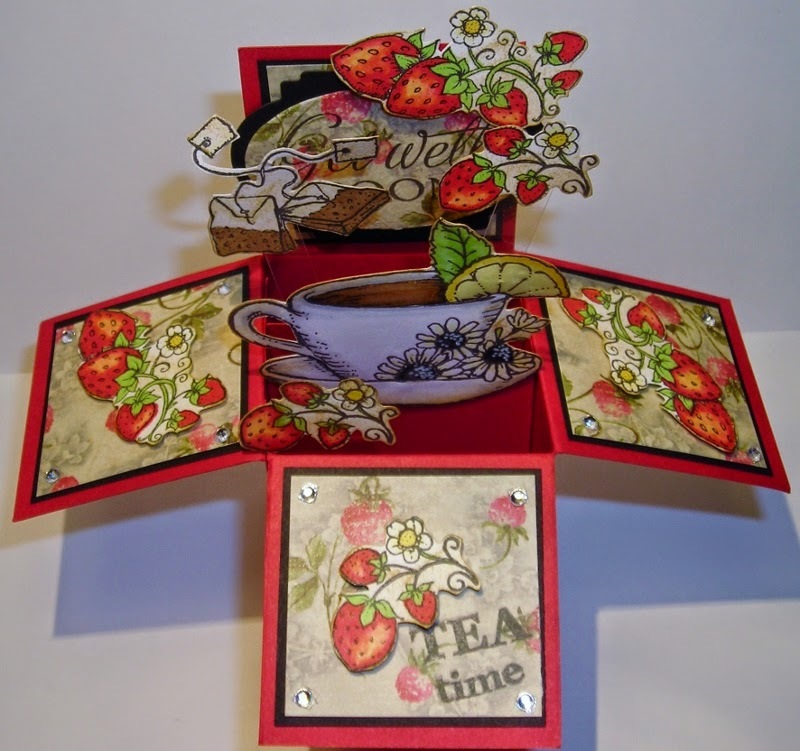 I used Flourishes- Grab a Cup for my images along with Flourishes- Berry Sweet Frame. I colored my images with Copics & Prisma Color Markers. I used Diamond Glaze on the tea in my cup & the flesh part of the lemon. Look closely & you can see my "Get Well" message. 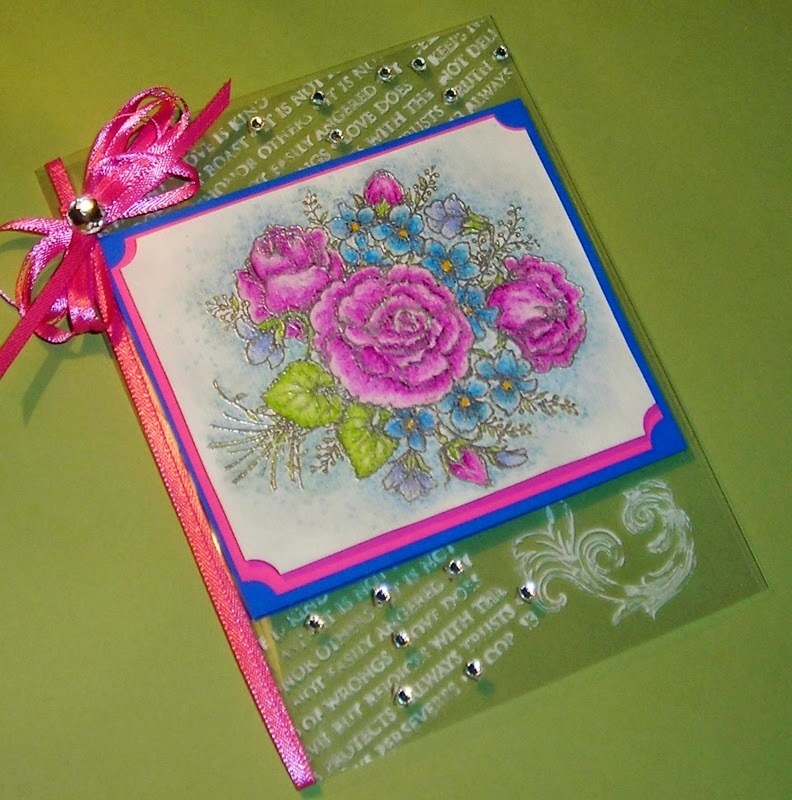 I used Flourishes- Sentimental Favorites along with Flourishes- Classic Frames Template Die. You can see the sections in this box. giving me more surface to add images. This is the front flap. I used Flourishes- Grab a Cup. 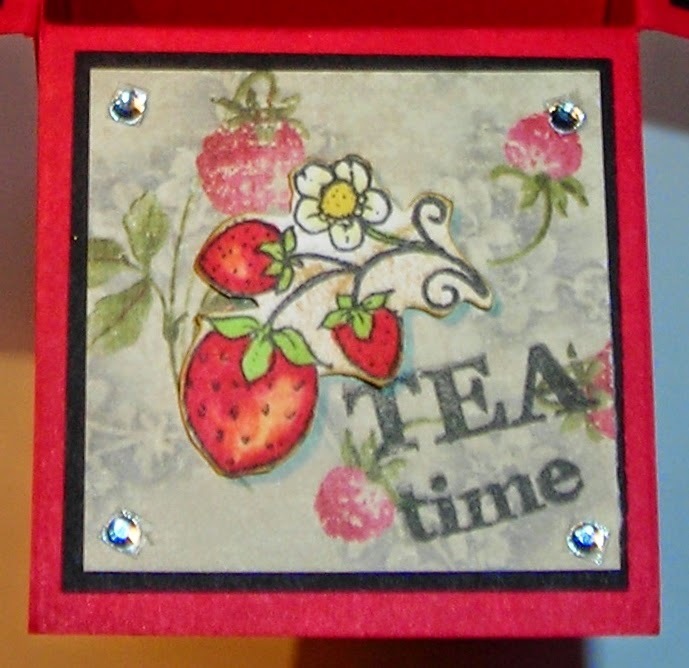 I will tell you I used the stamp "Coffee Time" from the set, & cut it in half, separating the words coffee & time. 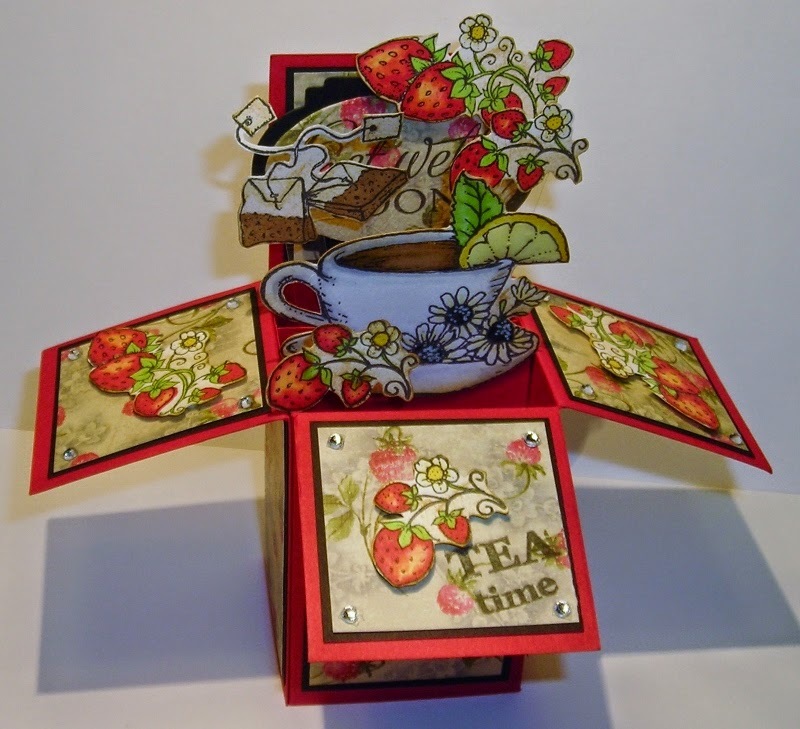 Then I paired "time" up with the word "Tea" in the set. This is a close-up of what the sides look like. You can see I only have a little bit of the stamped images popping out from the top. 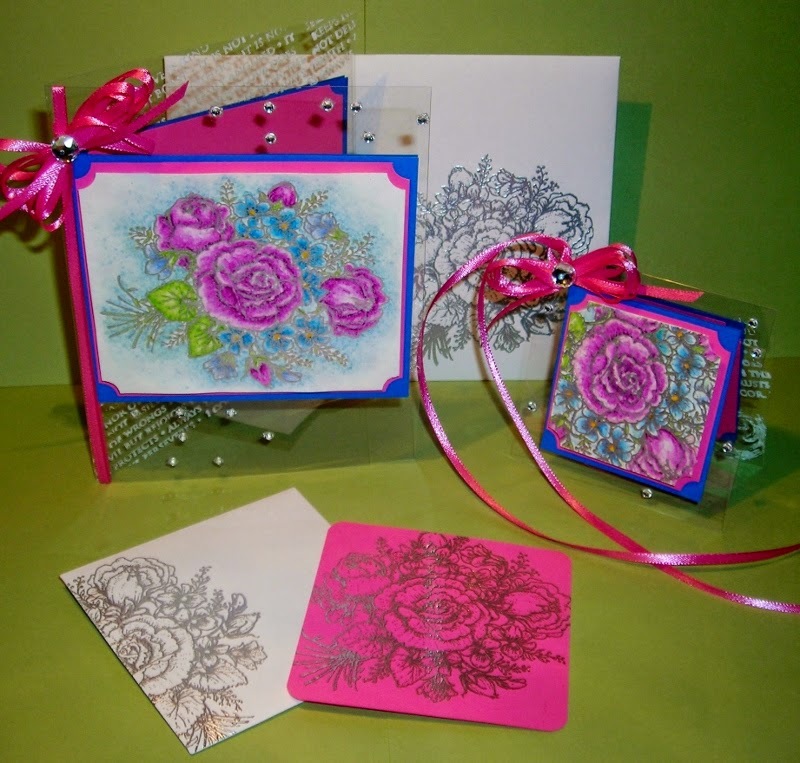 Don't forget to make a matching envelope. You want the recipient to know that something special is inside for them! 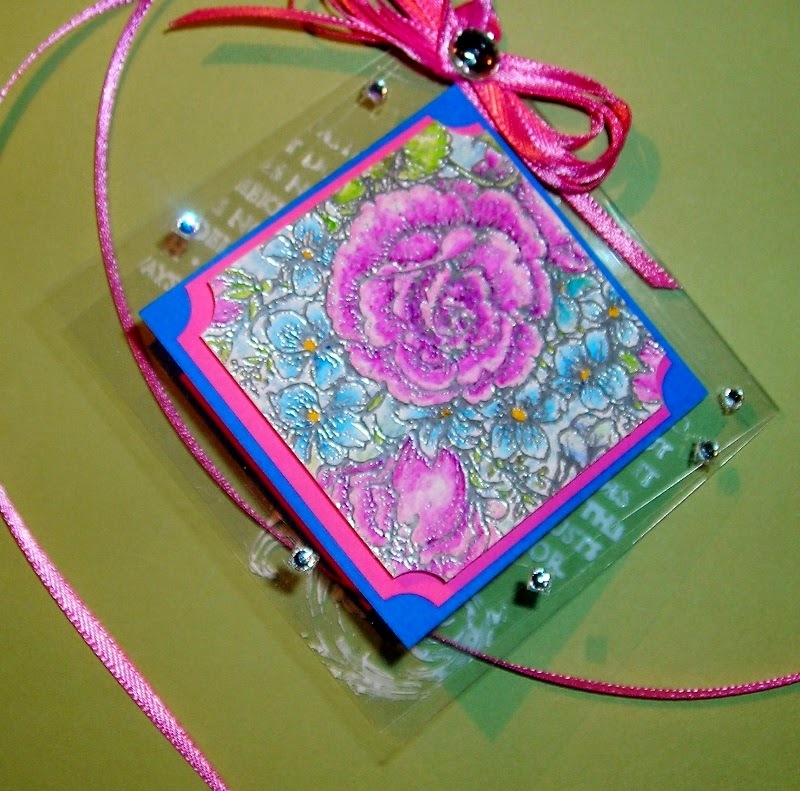 For the smaller size Pop-Up Box Card, see the WRMK Envelope Board. 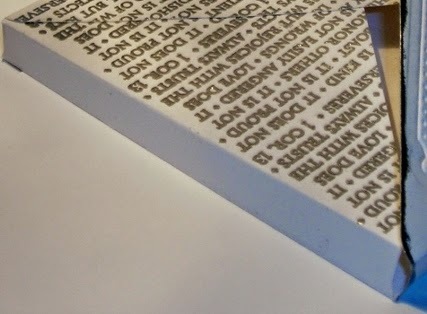 I used the measurements for a 4" x 5 1/2" (5-Bar) card size for my card. & will be sure to lift spirits, I'm sure. It's already in the mail to a very special lady in need of a pick-me-up. Here's one of the recipes I told you about several weeks ago that I thought you might like to make. It's a perfect 4th of July Dessert or it can be a Tea Time Favorite. Cream these till they are fluffy. Then finish filling the two cup measure with flour to the 2 c. mark. Pour the dry ingredients into the wet ingredients gently, mixing as you go. Pour into a floured 9" x 13" baking pan. Bake at 350 degrees for 30 min's. Check as you would a cake to be sure it is done. You can add frosting after it is done or powdered sugar or leave them plain. 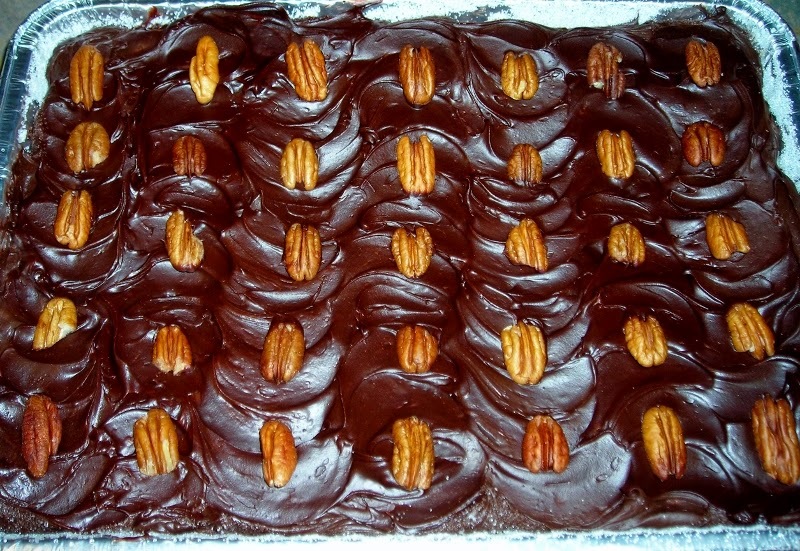 You can also add Peanut Butter pieces etc., whatever you like to the mix before you bake it. You can't seem to go wrong with this recipe. Believe me, you will love this recipe! It is an old family recipe that everyone loves. So, what do you think about my card this week? All of your comments are truly welcome & appreciated. 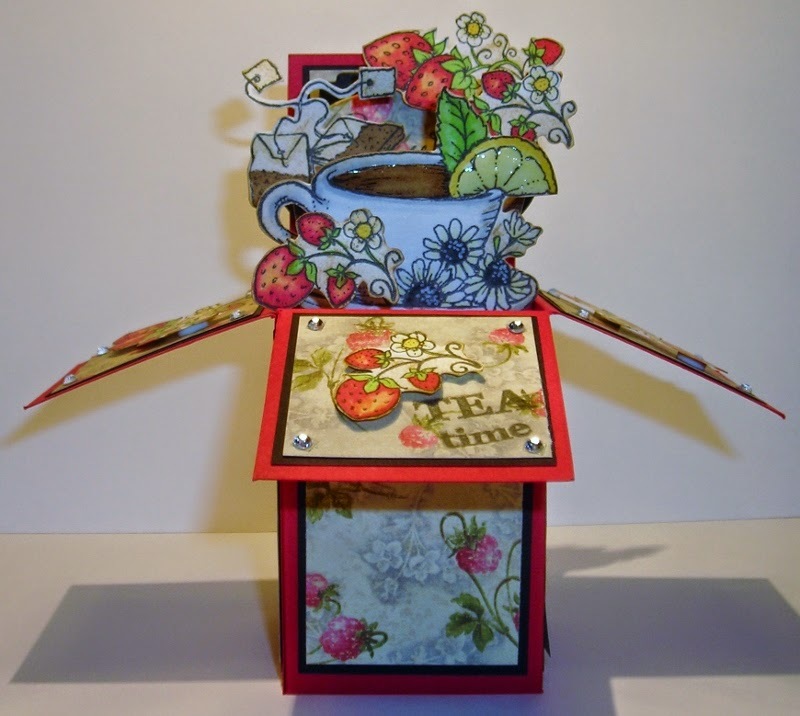 Enjoy some Tea today & try your hand at one of these cute little Pop-Up Box Cards! 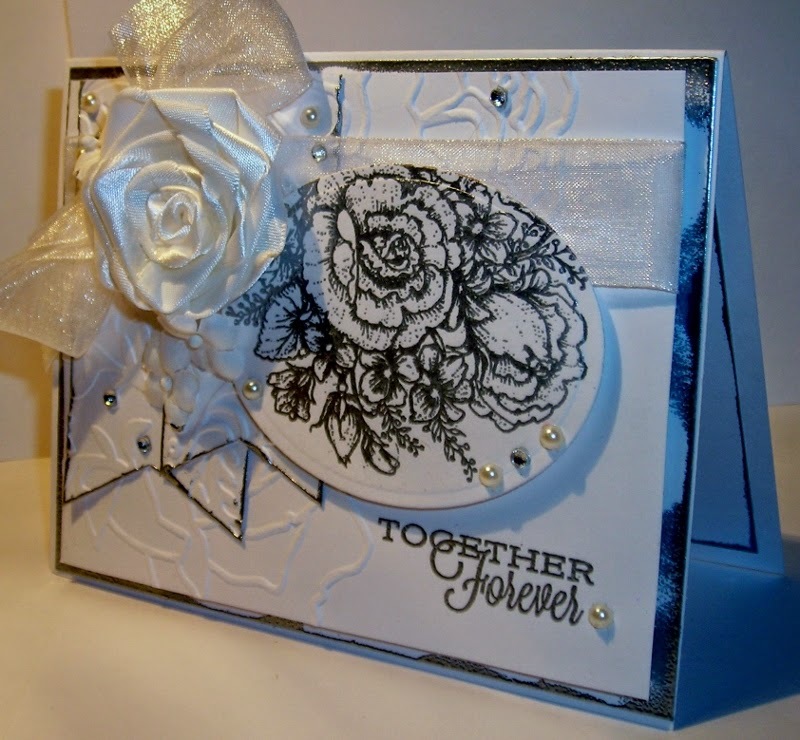 I have that last Wedding Card for you today! & it inspired me to make my own. 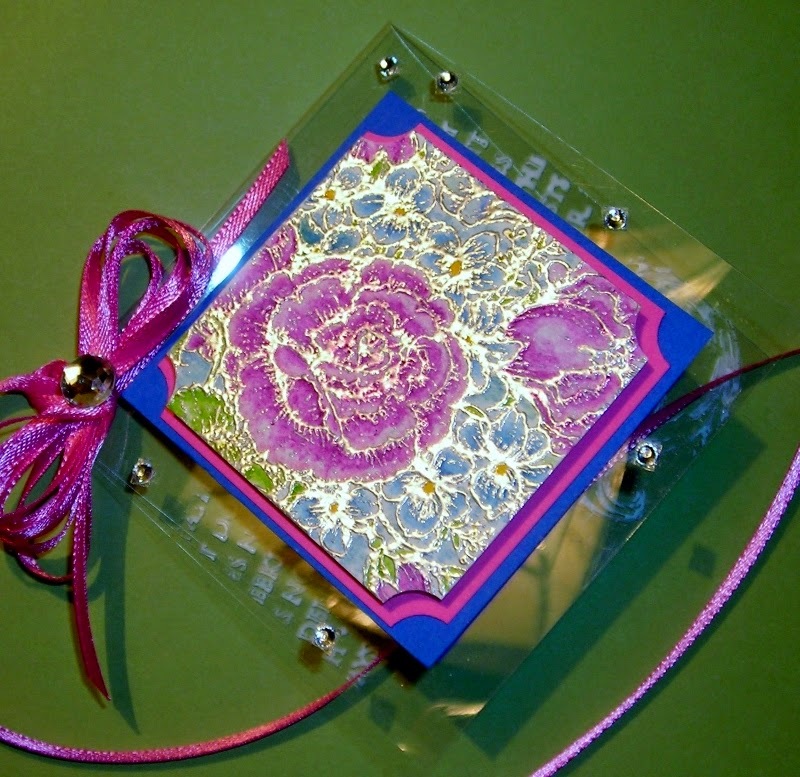 Using acetate just gives a different & maybe a little more modern look to your creations. 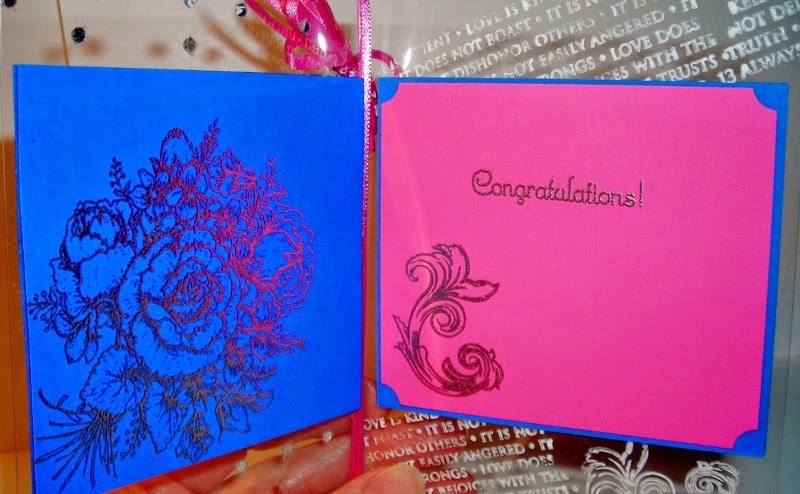 My Color Scheme was taken from the Bride & Grooms Invitation---Hot Pink & a Royal Blue. I've used a green colored background color so you can see what I've done & I have lots of pictures for you, so hang onto your hats! 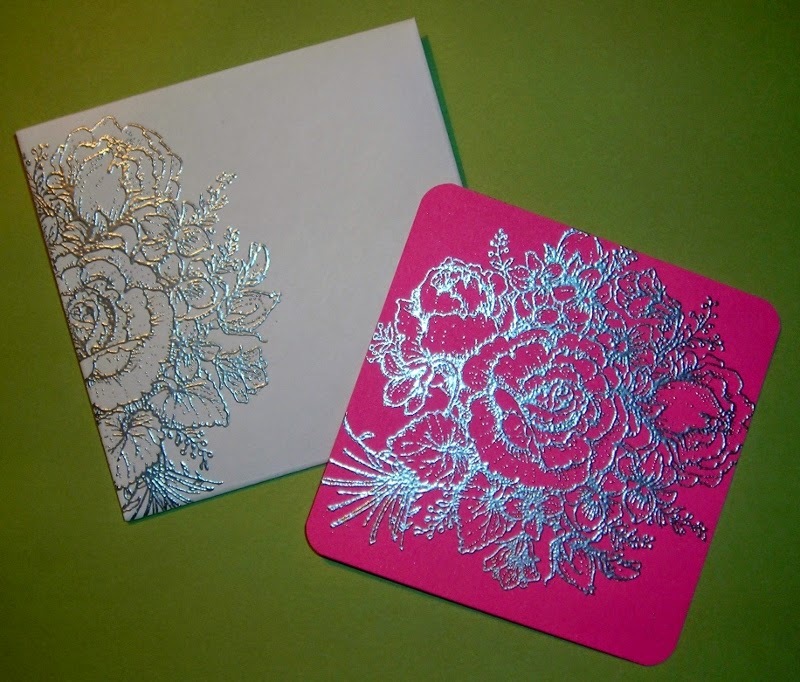 Here you can see the Silver Embossing--SU-Silver Embossing Powder. Have you noticed that I used a Faber-Castell Artist Pitt Pen-white? & then when I go to use it, I can't! So, I LIKE using my Pitt Pen! 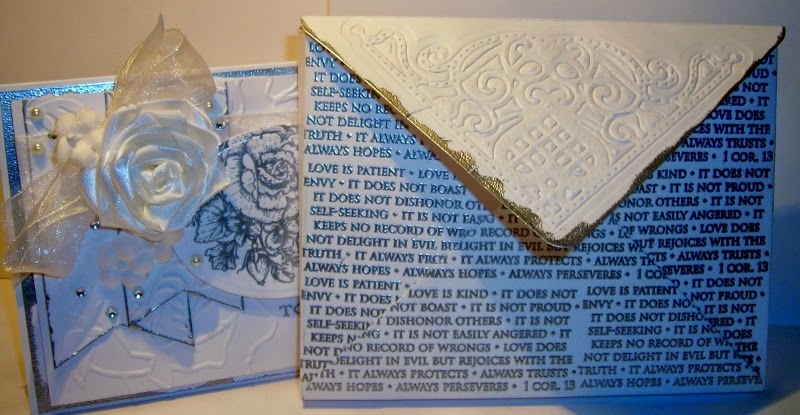 Here is the inside, where we'll write "To & From...."
& the writing in white is from Flourishes- Wild Roses. it is from Flourishes- From the Heart. 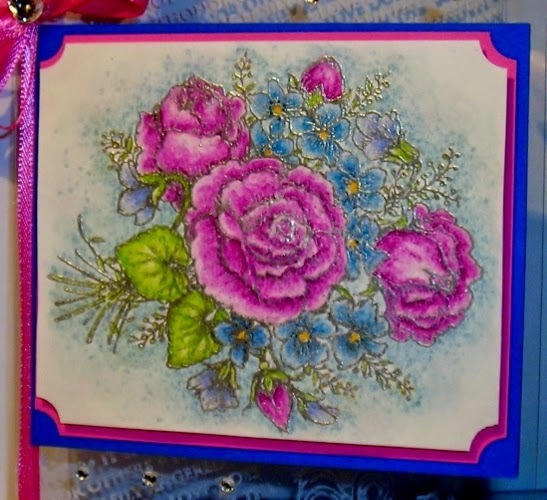 Here is a closer look at the stippling I did with my Letraset Water Color Aqua Markers. The sentiment is from Flourishes- Sentimental Favorites. one needs to add your name to the inside of your gift, so "helpers"
don't remove your tag or card from the gift & confuse the receiver? 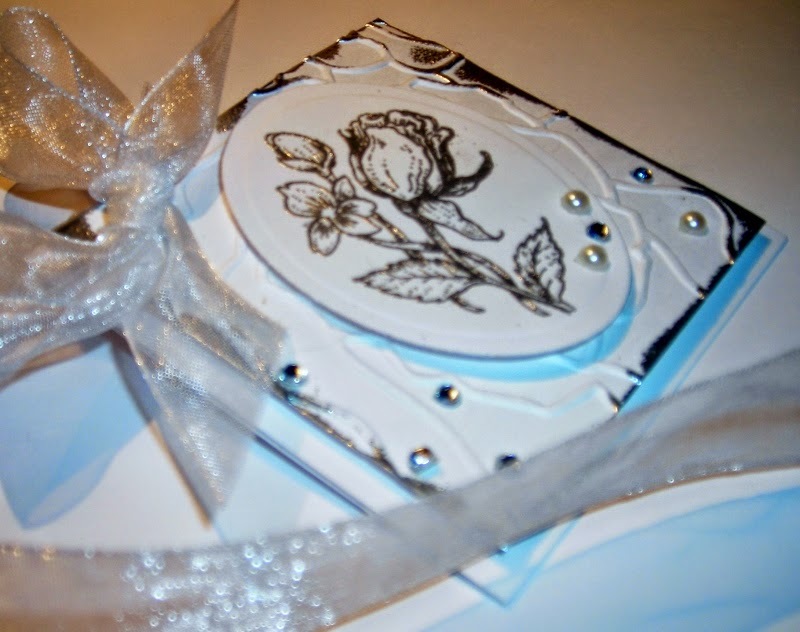 Well, I came up with this---a "Gift Receipt Envelope & Insert" telling WHO the gift is from! 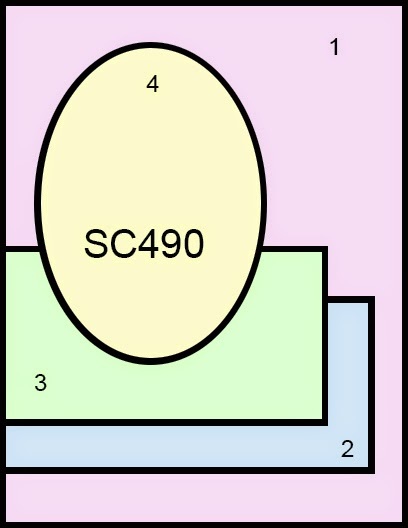 just a square piece of paper with rounded corners---SU Corner Punch. Our son will just slip this right inside the top of the box with his gift before it is wrapped. I've been using these Flourishes sets a lot this month with all the weddings our kids are going to. 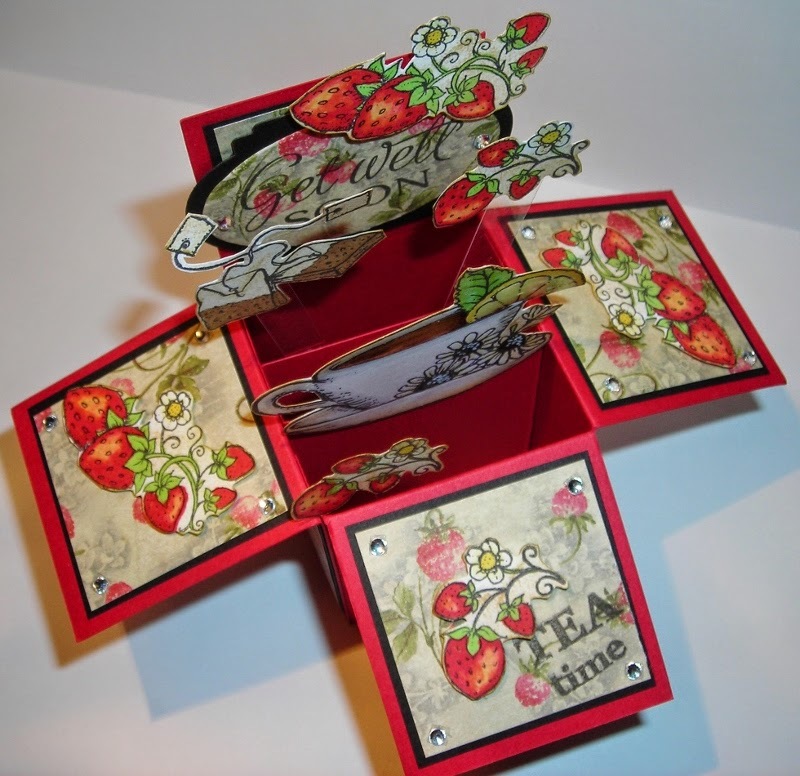 But, you can see there are many ways to use these wonderful images from Flourishes. Each & every time getting a different look to your creations. I know Jan Marie & Mike would love to serve you! Wishing this couple Many Happy Years of Wedded Bliss! 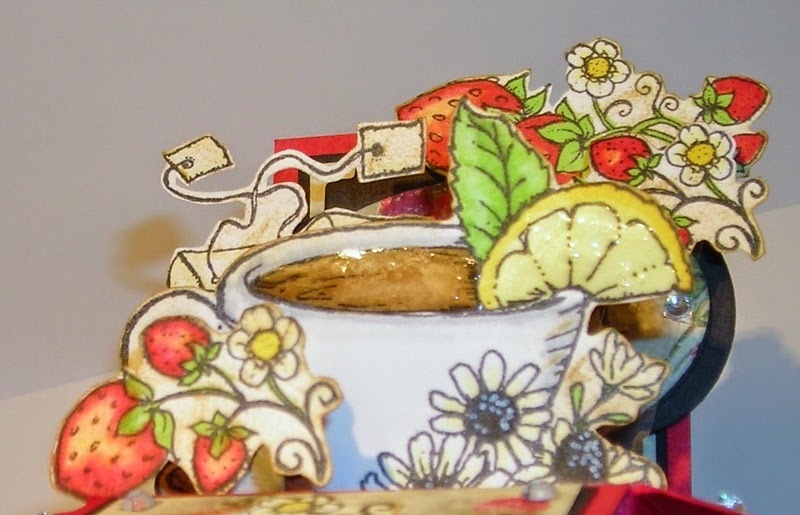 Be sure to come back next week to see "A Soothing Tea Creation & a Recipe!" U:Create Watercolor Paper, 90 lb. 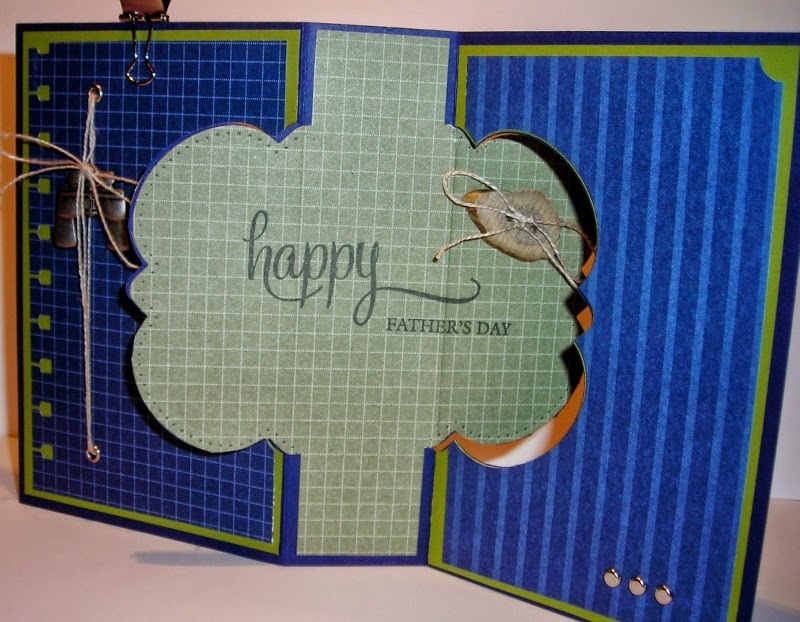 I created a Father's Day Card for you this week. 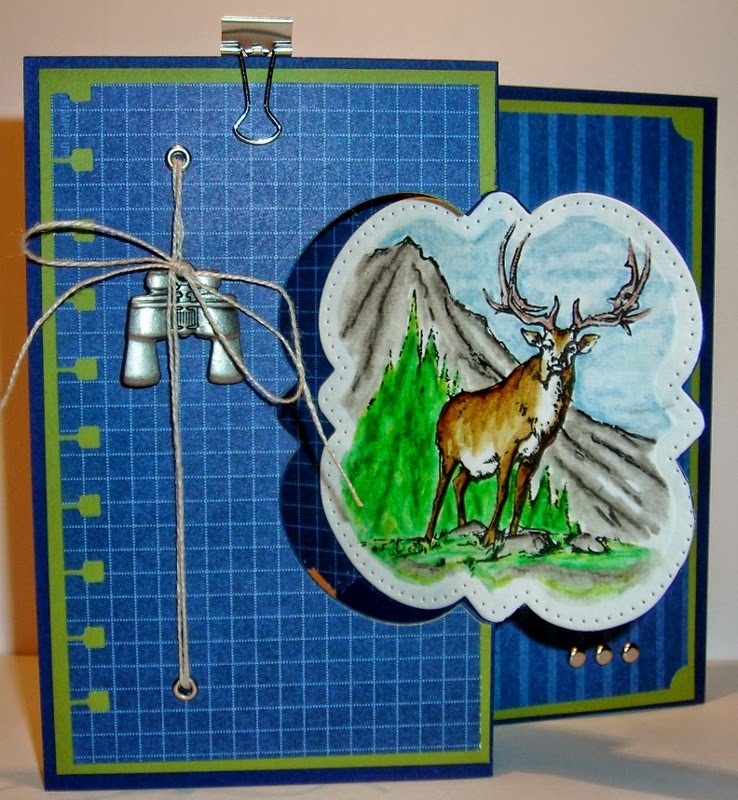 ( I usually use earth tones), & I have a new fold for you! to create my "Double Swing (Flip-Flop) Card!" I am always looking for "Fun Folds" for my cards! with my Faber-Castell Big Brush Pitt Pen- black, & Letraset Watercolor Aqua Markers. This is the backside, or the "flip" side! 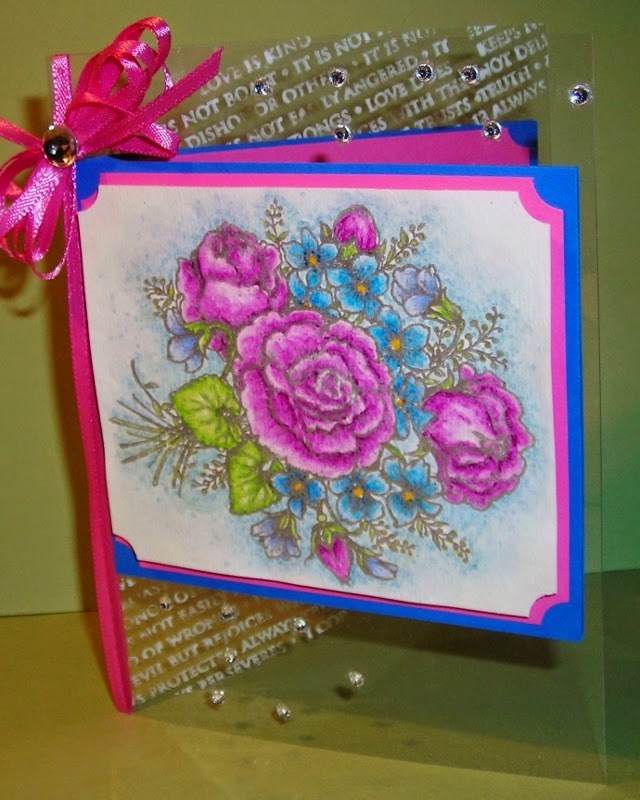 I used Flourishes- Inside & Out- Happy stamp set. 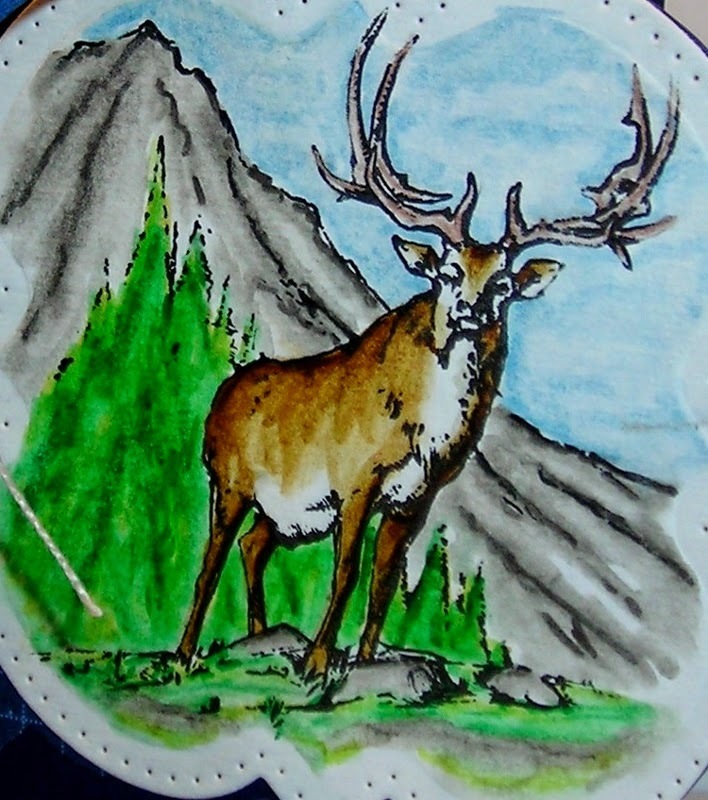 Notice, I placed an Antler Button with Linen Thread on the backside. I thought it needed a little embellishment. Here is a close-up of this beauty, created by Lauren Pope. 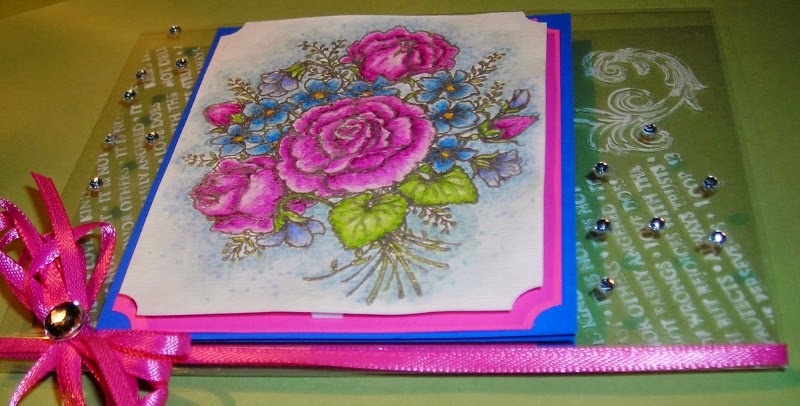 When Flourishes first came out with this stamp set, I knew I had to have it! My husband is an out-door's man & enjoys images like this too. He's been known to use my stamps for his crafts too. Have you ever seen one of these majestic creatures? it was an up-close experience! I had to stand & just look at him for awhile! He was huge, standing much taller than a man or our truck! My husband's head came up to his shoulders! Just after I pulled back slowly as not to startle him, so I could grab the camera, he took off up the mountain side, so I wasn't able to get a picture. It was such a treat to see him that morning! So, that is one of the reason's I thought the binoculars would work with this card. I think we got a very special treat that morning & not too many get that close to one of these wonderful creatures! Hope you like my Father's Day Card & it helps to inspire you to create something extra special for those men that are Father's in your life! 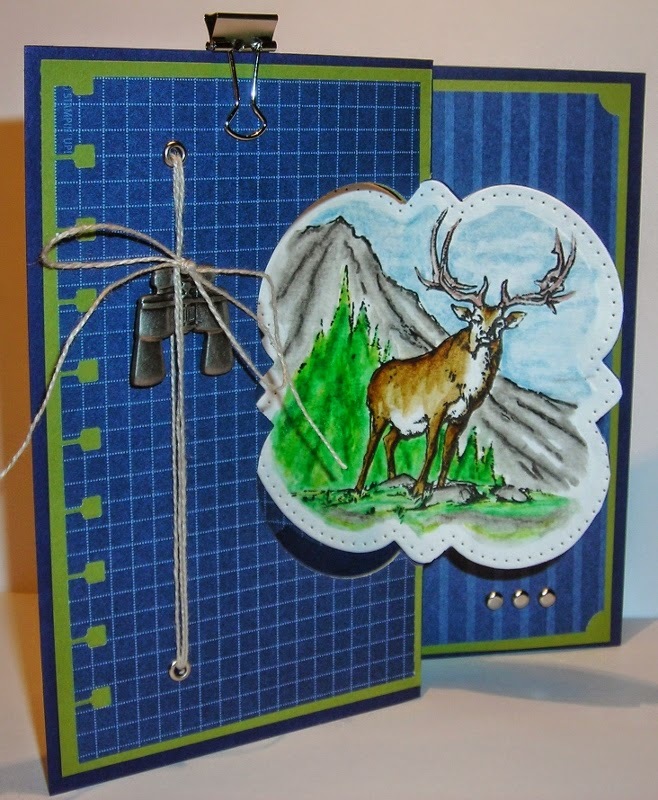 Addicted to Stamps- The theme is "Outdoors." Catered Crop- The theme is "Manly Men." That Craft Place- The theme is "Men." 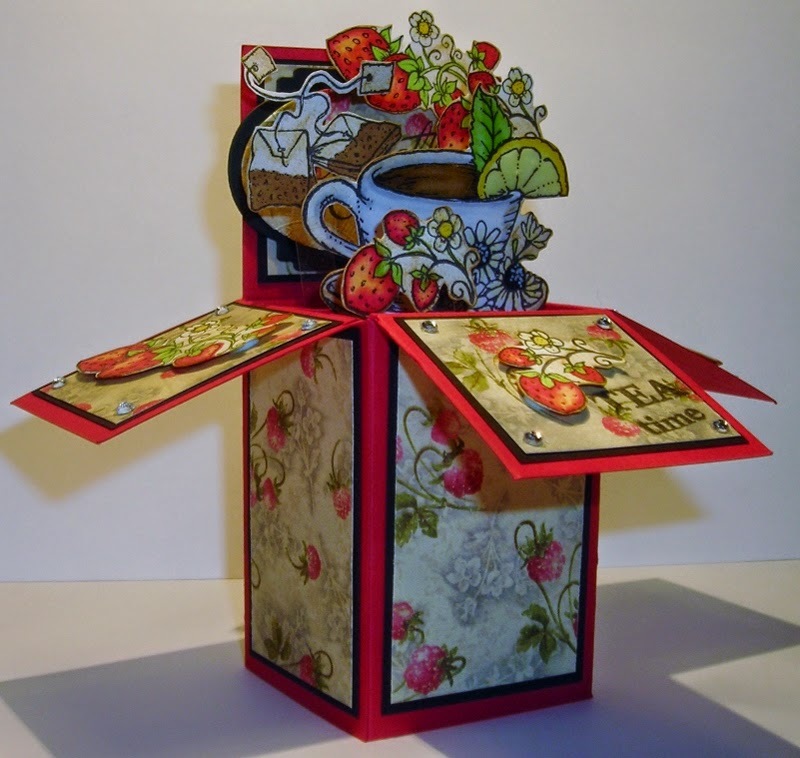 Craft Hoarders Anonymous Challenge Blog-Challenge #9- The theme is " Fold It!" Make It Monday Challenge Blog- The theme is a "Male Theme." 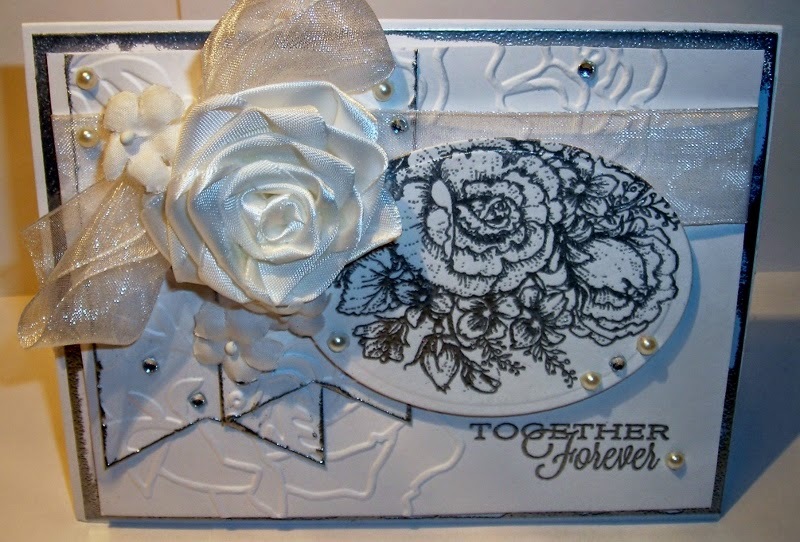 I am back again this week with another Wedding Card. Perfect, since June is a month usually filled with weddings. I think this one came out beautifully & so far is my favorite. I wanted to do a white on white with silver & just take a look at what I came up with! 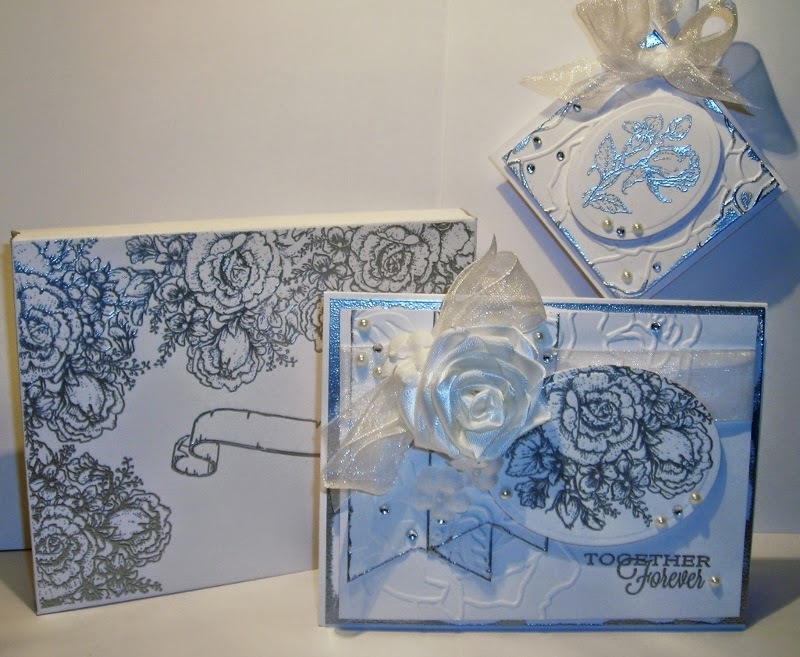 The silver embossing powder looks a little dark, but believe me, in real life it is gorgeous! I just gave it a little turn. This card came out exactly like I wanted. & the sentiment is from Flourishes- Picking Wildflowers. Jan Marie & Mike will be happy to help you with your order. 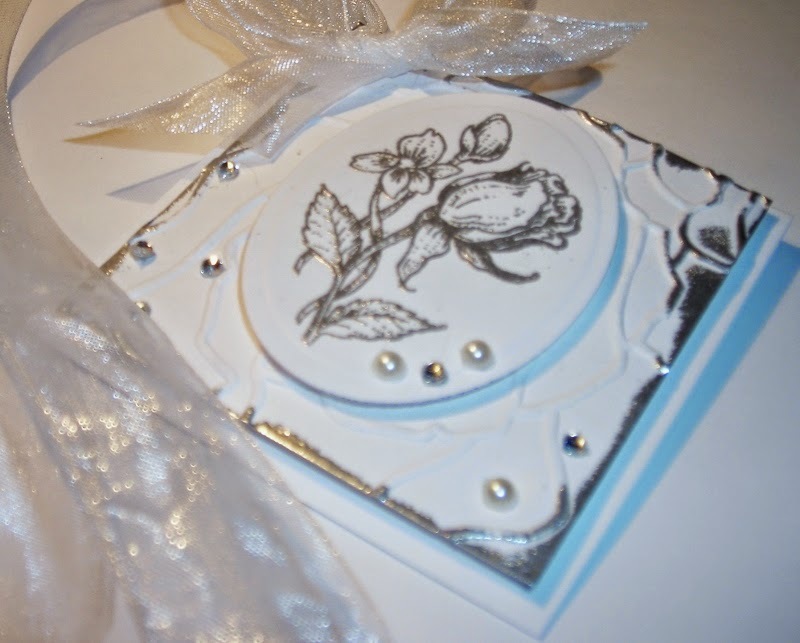 Back to my creation, lots of dry embossing & heat embossing with this project. 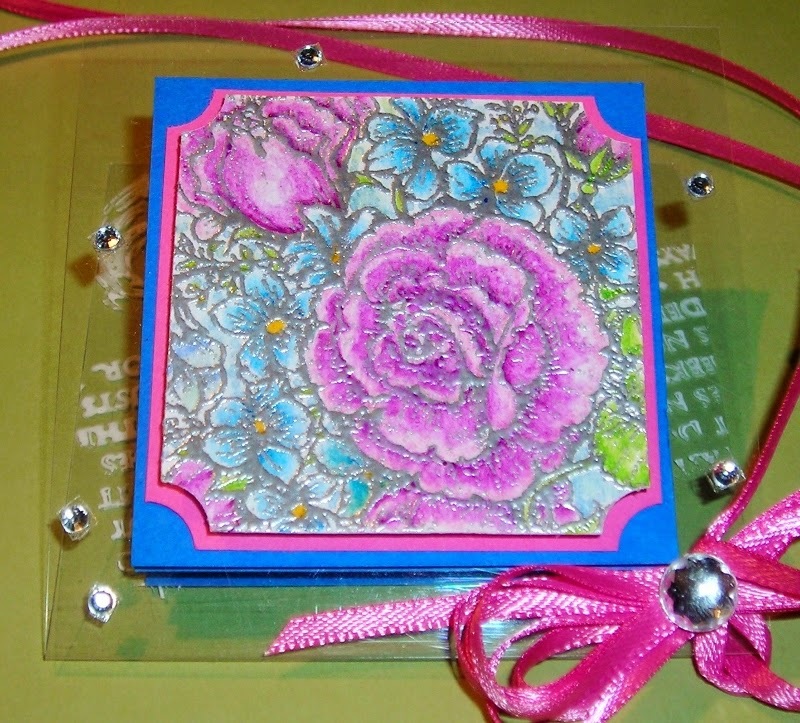 I used SU- Manhatten Flowers, & Elegant Lines, & Cuddlebug- Victoria. 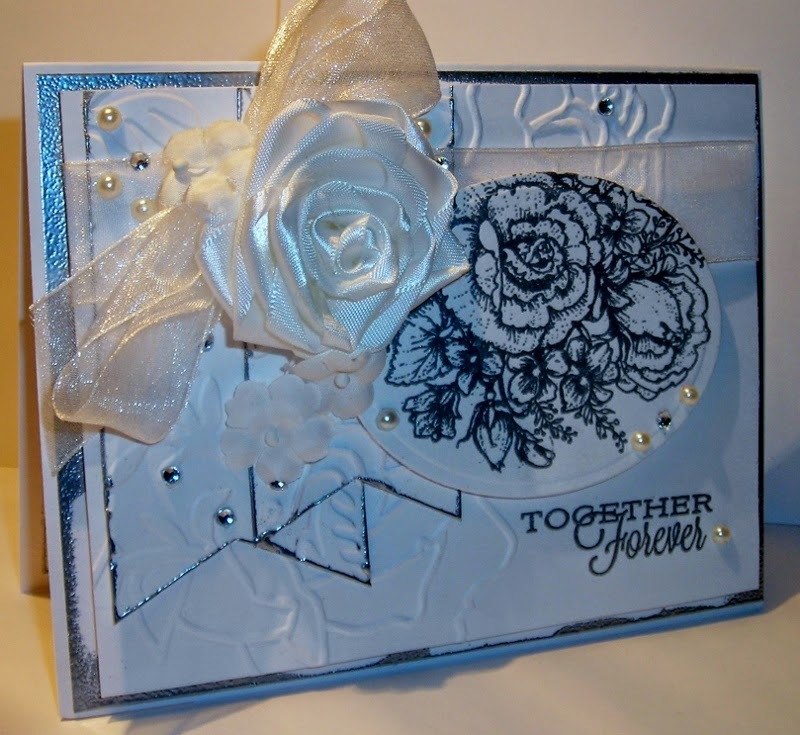 I also used SU- Silver Embossing Powder & Versa Mark. And a gorgeous Satin Flower! Here is what some of my tries looked like. They're tricky & it takes practice. You can see the different shapes, but they're supposed to be round & flat. 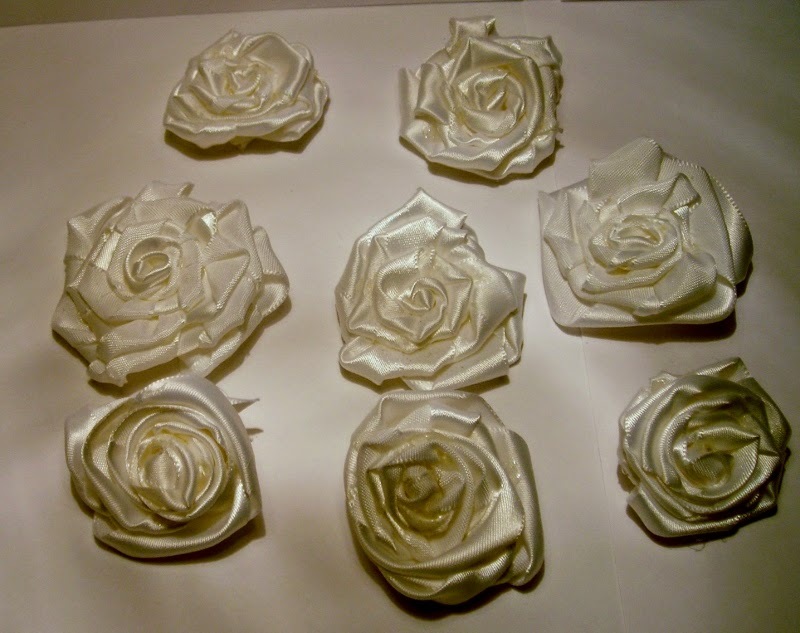 I also discovered you will get 9 Roses from 18 ft. of Ribbon---each rose is made with 24" of ribbon. 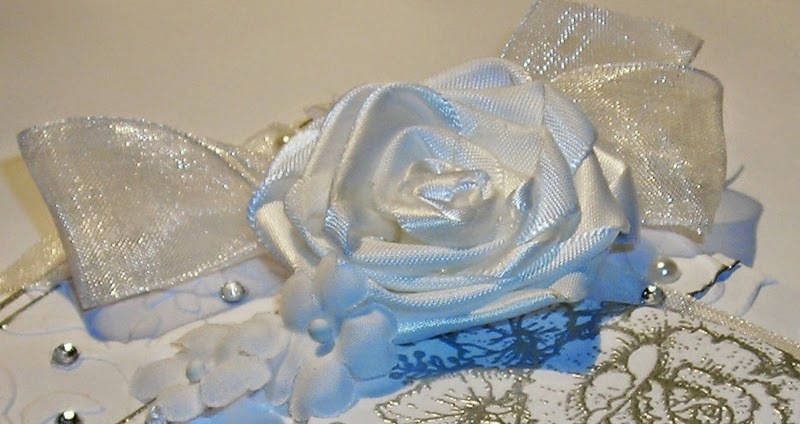 I used ribbon that is 7/8" wide. or spritz them & dye them whatever color your heart desires. There are endless possibilities with these lovelies! The lady on the You Tube Video suggests 1"- 1 1/2" wide ribbon. Watch her closely! 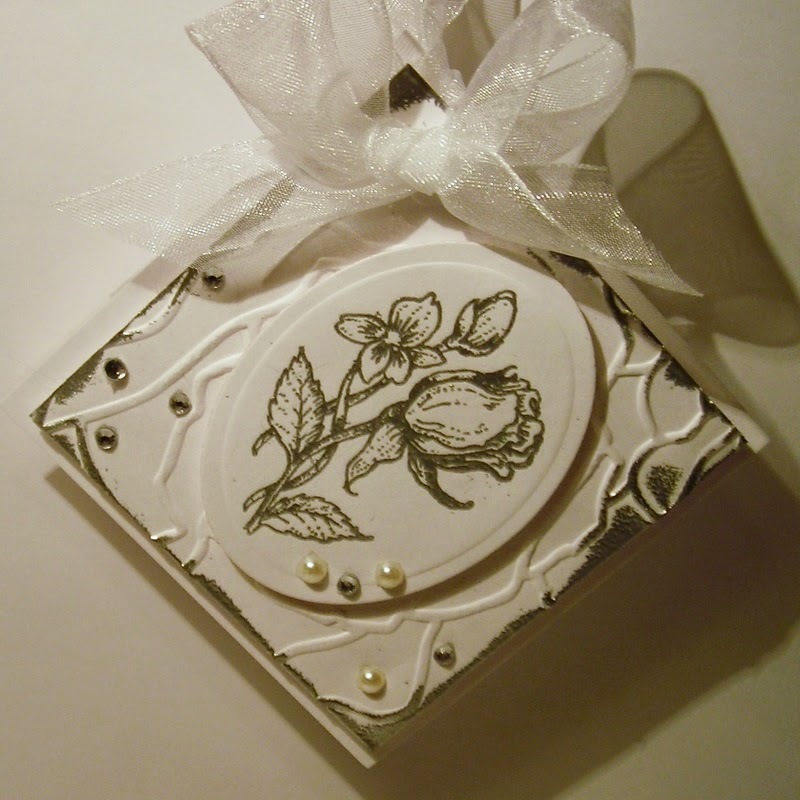 This is the Rose I chose to attach to my card. I am extremely pleased with how it came out. One suggestion, when using the hot glue gun---if you have one of the larger glue guns, set it on low. & the sentiment is from Flourishes- Sentimental Favorites. Next, I have the envelope! 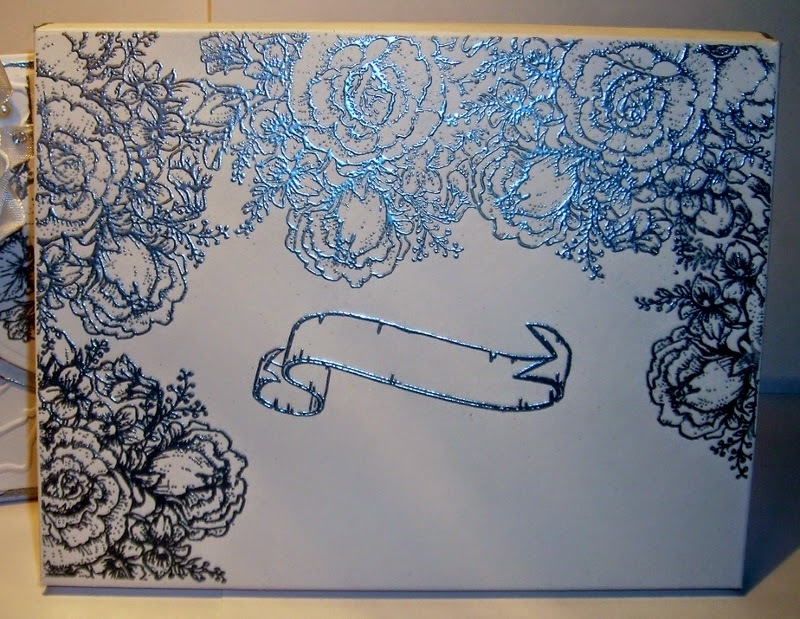 & knew this would be the way I would do my envelope for this card. & the scroll is from Flourishes- From The Heart. I'll write the Bride & Groom's names there. This Envelope is 3/8" deep. 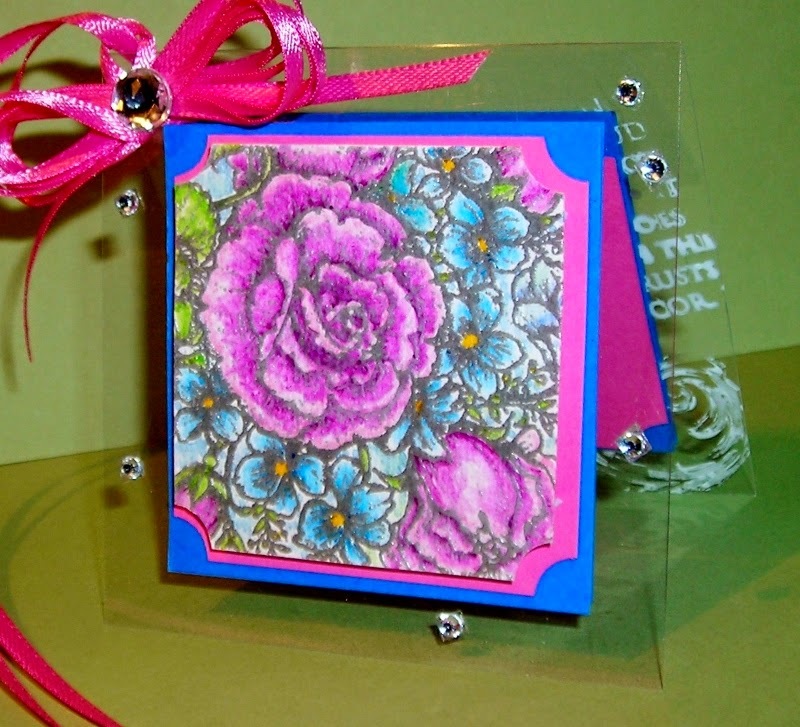 A perfect envie for a special 3-D Card. This is the backside of this special envelope. 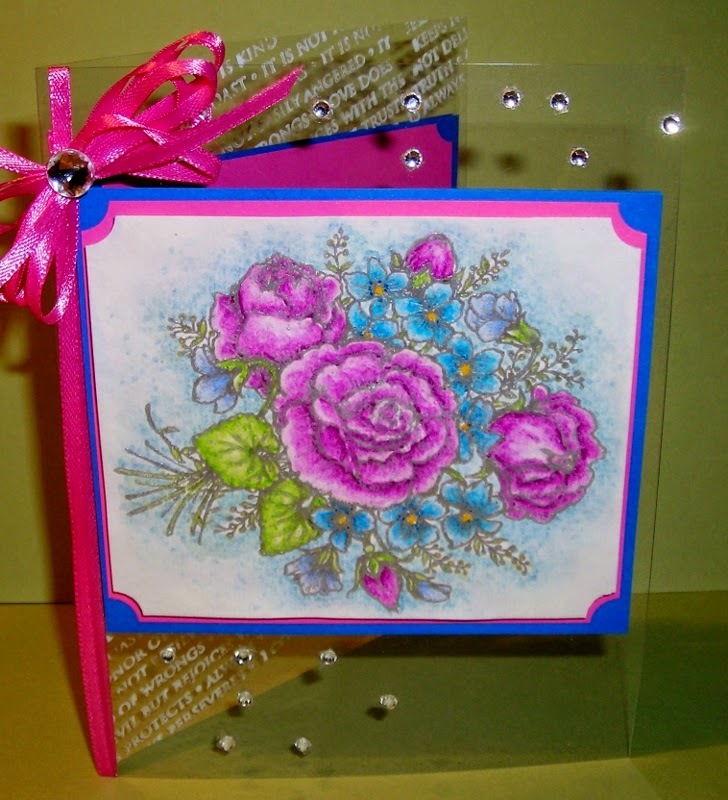 I used Flourishes- Wild Roses. 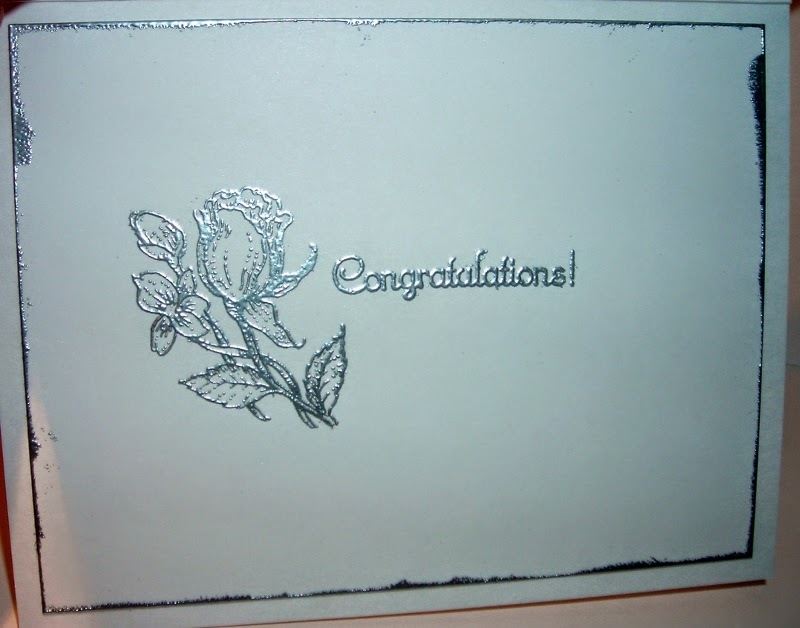 The embossing is done with a Spellbinders Corner Die, (ODB). 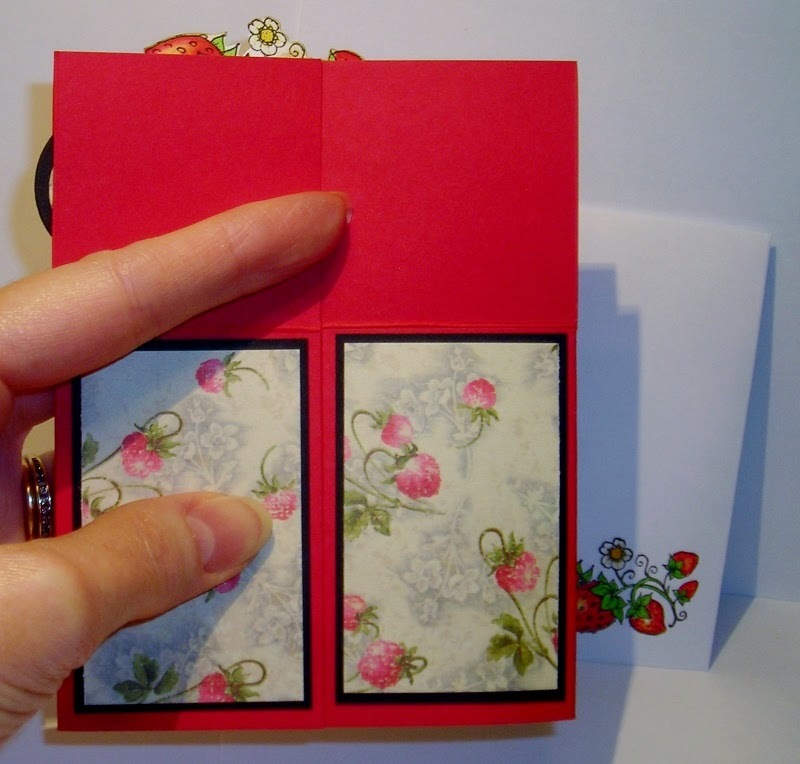 create an envelope size one size larger than you are desiring--without folding it. I made an envelope for the card size 4 1/2" x 6"; my card is 4 1/4" x 5 1/2". 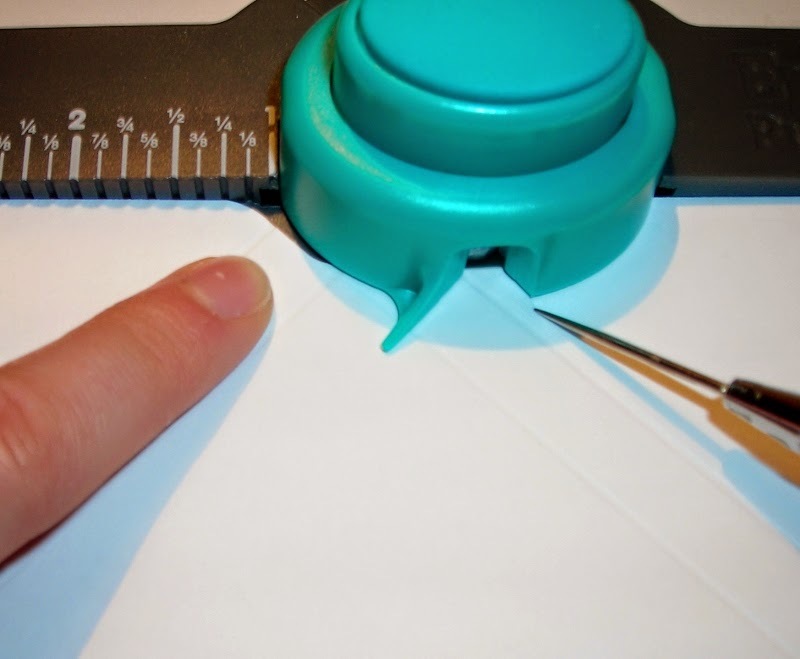 Use the curve from the aqua colored punch & line it up against the punch, then score again. yes, you would move it over just a little more. Do this with each already punched area. I used my Score-Buddy to finish off the scoring--where you don't get a good score line. Go ahead & fold your score lines. 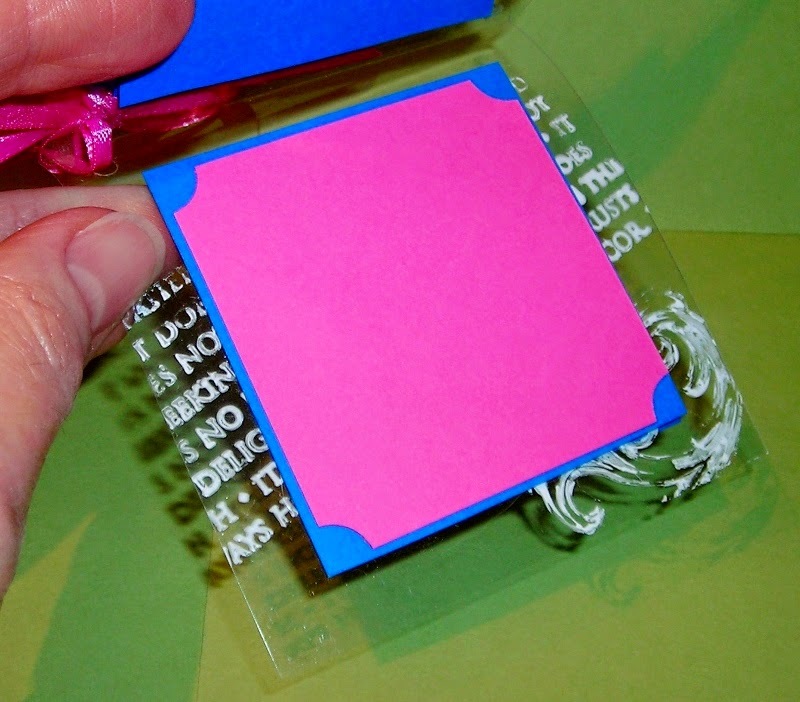 then glue your envelope with a good adhesive. I used Scotch Quick Dry Adhesive. I am totally pleased with how this set came out. Perfect for a June Wedding! Be watching for another Wedding Card in the near future! Know all comments are gladly welcome & much appreciated! 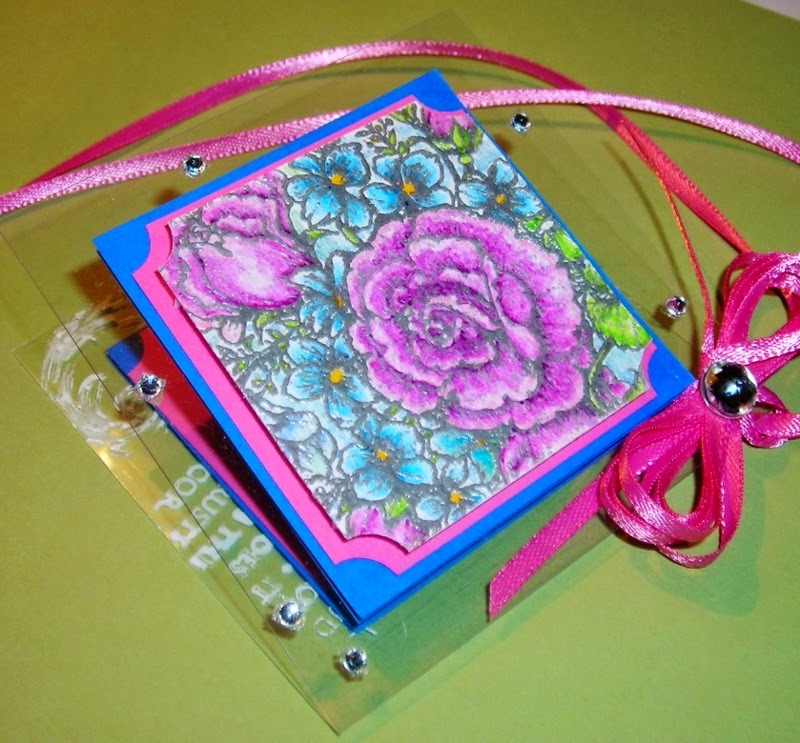 Craft-Dee-BowZ- June Challenge- Anything Goes with a Handmade Bow. Make My Monday- Weekly Challenge-The theme is Wedding. 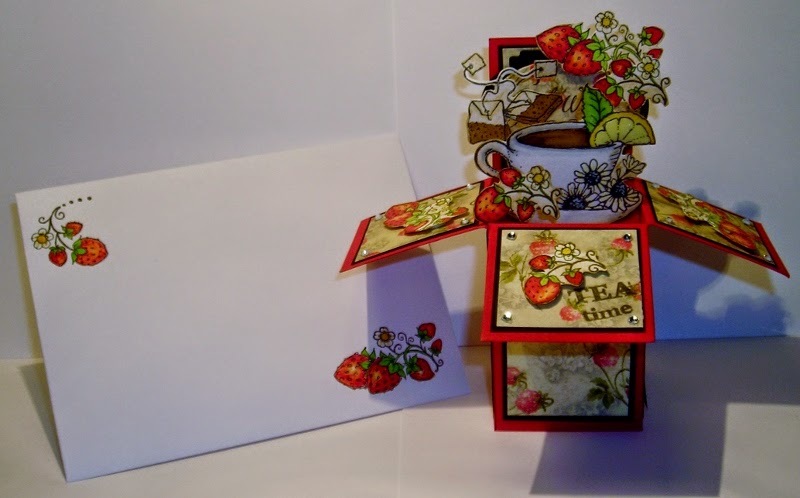 Vintage Stamping Challenge #21- The theme is Summer Blooms. 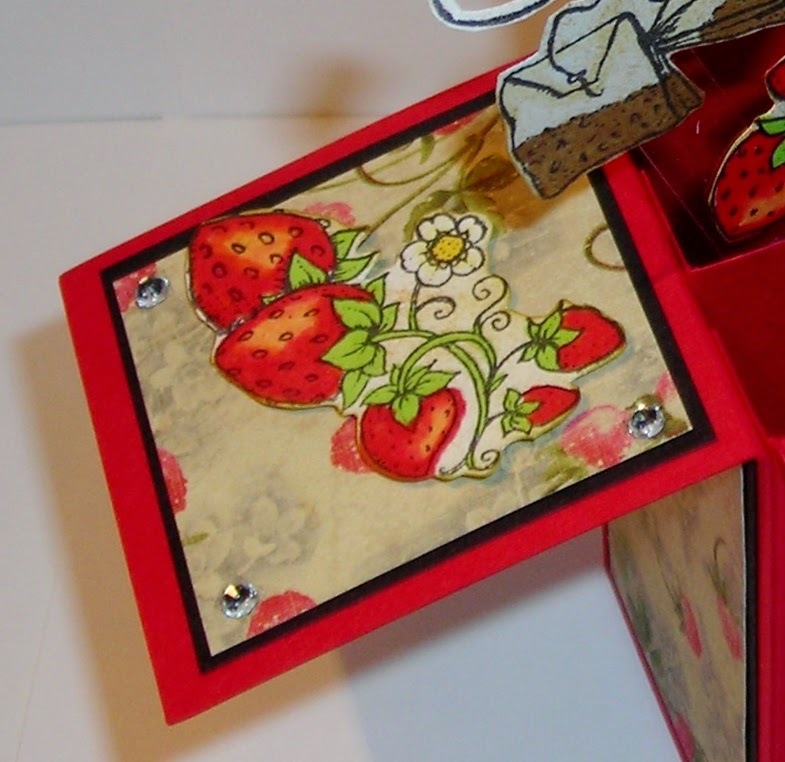 The main focal point should be stamping. Challenge closing- Midnight, Sunday, 6 July 2014. Winners & Highly Desireables announced- Monday, 14 July 2014. My Gift Card is 3" x 3"